Set and display prices for WooCommerce products in different currencies. This plugin is a premium version of free "Currency per Product for WooCommerce" plugin. 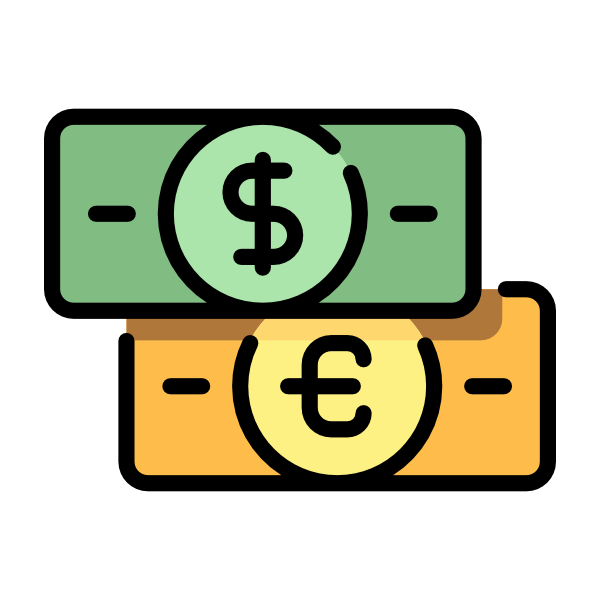 Currency per Product for WooCommerce plugin lets you set and display prices for WooCommerce products in different currencies. Set product prices in different currencies and display it in shop in different currencies. Set product prices in different currencies, but display it in shop in one currency, converted with the exchange rates (i.e. “multicurrency product base price”). Set product prices in different currencies, display it in shop in different currencies, but convert it to one currency in cart and checkout. Possible options: “Show prices in different currencies (and set cart and checkout behaviour separately)”, “Convert to shop default currency (including cart and checkout)”. This option is ignored and always set to “Convert to shop default currency”, if you’ve selected “Convert to shop default currency” as “Shop Behaviour” option. Possible options: “Convert to shop default currency”, “Leave product currency (allow only one product to be added to cart)”, “Leave product currency (allow only same currency products to be added to cart)”, “Convert to currency of last product in cart”, “Convert to currency of first product in cart”. Here you can set message which will be shown to customer if “Leave product currency (allow only one product to be added to cart)” was selected for cart and checkout behaviour. Only one product can be added to the cart. Clear the cart or finish the order, before adding another product to the cart. Here you can set message which will be shown to customer if “Leave product currency (allow only same currency products to be added to cart)” was selected for cart and checkout behaviour. Only products with same currency can be added to the cart. Clear the cart or finish the order, before adding products with another currency to the cart. Save module’s settings after changing this options to see new settings fields. Enable this if you want to set products currency on per product author basis. Enable this if you want to set products currency on per product author user role basis. Enable this if you want to set products currency on per product category basis. Enable this if you want to set products currency on per product tag basis. Enable this option if you have issues with currency symbol in mini cart. It will recalculate cart totals on each page load. This will add currency selection to admin bar in reports. Exchange rates for currencies won’t be used if “Cart and Checkout Behaviour” is set to one of “Leave product currency …” options. Possible values: Enter rates manually; Update rates automatically. How often currency exchange rates should be updated. Server for currency exchange rates. Your shop base currency will be automatically added to the currencies list on product edit page, so you don’t need to add it to the list below. Number of total additional currencies (excluding shop’s default). After you set this number, press Save changes and new settings fields will appear. Here you can set currency you are going to use. Optionally you can also set which currency should be set for products category, tag etc. It’s not possible to have order in different currencies simultaneously. I.e. order currency will be converted either to shop default currency or to the currency of some product in cart (depending on what you’ve selected in “Cart and Checkout Behaviour” option). Please note that this is not a currency switcher plugin. If you need a currency switcher plugin, please take a look at Currency Switcher for WooCommerce plugin. the best add-on for the currency and great support. 51 thoughts on "Currency per Product for WooCommerce"
Unfortunately there is no demo at the moment, but there is a free version you can check – https://wordpress.org/plugins/currency-per-product-for-woocommerce/. Please let me know if that helped. The free version does not allow multiple currencies options. Is that true? In this case, can we have a trial before we make the purchase? No, actually you can have two currencies in free version – i.e. one is the default shop currency (which is added automatically to the plugin’s currencies list), and another you can add. So you can have products in two currencies with free version, for example – USD and EUR. I am using the currency per product plug-in so that I can sell products in USD and EUR on my site with a default currency of USD. For products with the currency set to EUR on the product page, the product displays in EUR on the product and cart pages as expected. When I get the checkout page the currency initially displays in EUR and then reloads to USD. I can complete checkout, but the order currency is in USD. Any advice on why the currency reloads on the checkout page and what I can do to resolve this issue? That’s strange. There is “Cart and Checkout Behaviour” option in plugin settings, which defines if currency should be converted back to shop default currency or not, however it should act the same on *both* cart and checkout pages. Maybe it’s possible to login to your server to check what’s going on (if yes – please contact me on [email protected]). I have a problem. my site with a default currency is TRY. But i use your plugin to show them with USD. I mean i want to show products with USD on my shop, but i wanna them to pay with TRY on cart. The problem is for ex one product is 10$. when i add it to shop bag, it shows 37$. It should be 37turkish liras. even i checked “Fix Mini Cart” there is no change. Besides, when i delete one product from shop cart, it change currency to TRY as i want. Hi the plugin is not working properly with the woocommerce filtering and sorting. The price used for those features is the original price not the converted one. So a product at 500 Yen is considered more expensive than a 300 Euro one. I would really appreciate your help on this issue. Thank you! omg, I did not notice until you wrote. mine is also not working. there are few problems with these plugin! This is now fixed in plugin version 1.4.0. You need to enable “Sorting by converted price” and “Filtering by converted price” checkboxes in plugin “Advanced” settings section (in “WooCommerce > Settings > Currency per Product > Advanced”). hi, I bought this plugin but its not updating the currencies automatically from the server, google or yahoo, how can we fix that ? Hi. How do I get a refund for my purchase? I’m not sure I understood the question correctly. Could you please try to explain it to me once again? And if you wish, you can share the admin login details, so I could login to your server and check it out – my email is [email protected]. Hi, I’m having a similar issue as others. My checkout page initially loads with the right currency, but then switches to a different one in the review order portion of the checkout page… Is there a fix yet?? It is super annoying and I paid for this thinking it was my be all/end-all solution. Hi, I would like to purchase your plugin, but I need to be sure it works as I expect. The demo version does nothing, only one currecny its the defualt state of WooCommerce. Would you make of the purchase in case something in the proccess wouldn’t be as expected? Sure, we’ll process the refund if anything is not working as expected (it’s a 30 days “no questions asked” refund policy at wpfactory.com). Alternatively, if you’d wish, I could try to fix any issues you have. Regarding free version however – you actually can have two currencies there – i.e. one is the default shop currency (which is added automatically to the plugin’s currencies list), and another you can add. 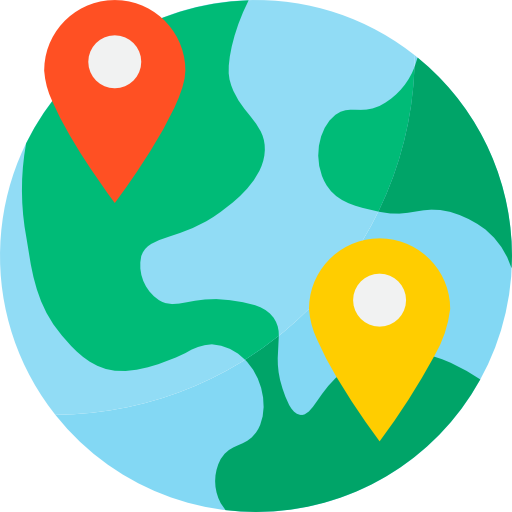 So you can have products in two currencies with free version, for example – USD and EUR. I bought your plugin. My website default is ZAR, however I am displaying different products in USD and EUR. I have checked “leave product currency (Allow only same currency products to be added to cart) in Cart and Checkout behaviour. Hi, I bought this plugin because I want to can selection dollar currency for all countries and colombian currency only in Colombiam I activate this plugin however I Can`t change currency in the product data section in woocommerce administration. 1. On the cart preview (when you click the cart icon in the upper right corner), all the prices are in RSD, and no product is converted. If the product price was 100eur and should be converted to rsd, it just says 100rsd. I tried to set the conversion to Yahoo, Central European bank, but nothing happens. After that I tried to set the rates automatically, but than I have “inf” displayed instead of price. Please tell me how to solve this. 2. Plugin crashes when I try to convert the currencies manually by clicking on “update now” button. If you can solve this please do it as soon as possible, if not I am requesting a refund. In case if anyone else has similar issues – as we figured out in private conversations – problem is solved in plugin version 1.3.0. There we’ve added new exchange rates server option “Free Currency Converter API (free.currencyconverterapi.com)”, which updates RSD rates properly. Also if you have issues with mini-cart widget, please try enabling “Fix mini cart” checkbox option in “WooCommerce > Settings > Currency per Product > Advanced Options”. I have faced a problem with the plugin I have set the different currency for one product, but when i buy a product, cart status showing me wrong information, can you tell me where is the issue? If you mean that wrong info is shown in WooCommerce mini cart widget – could you please try enabling “Fix mini cart” checkbox option in “WooCommerce > Settings > Currency per Product > Advanced Options”. You may need to clear your browser’s cache after enabling the option. Please let me know if that helped. Thank you for you response, I really appreciate that. I have enabled the **Fix mini cart**, but still when I but the product , the mini cart showing me wrong data and as well as main cart page. I am share with the one product page link: https://www.mysecuritymarket.com/product/counter-terror-asia-expo-2018-ctax/ , I have set Rupee 11,000.00 and converted price is looking good for me, but when I buy this product cart showing absolutely wrong, Could you please explain me where are the issue, and also please share with me where is your available time that I can get feedback very quick and fix the issue and buy your plugin. I really need a feedback from you, so I can buy your plugin and live the site. In case if anyone else has similar issues – as we figured out in private conversations – problem has been solved in plugin version 1.3.0. It was a compatibility issue with “WooCommerce Bulk Discount” plugin. In new version we’ve added “Save products prices” checkbox to the “Advanced Options” section (in “WooCommerce > Settings > Currency per Product > Advanced Options”). Enabling the checkbox solves the issue. I installed this plugin in my woocommerce site and the plugin is working well in the shop page and also in the product single page (showing price $149), but when I add to cart that product which price is converted with this plugin the mini cart is showing $2.3 and the cart page is showing $0.3 , but if I add to cart a normal product which price is not converted with this plugin then the mini cart and cart page is showing correct price that is $149. This is the problem with this plugin I have, So please tell me how can I fix this issue and tell me another thing that, I am using the free version of this plugin , if I use the pro version then is the issue fix or not ? Please reply me as soon as possible , I need to fix this issue very quickly. We’ve just released new plugin version 1.3.0. There we’ve added new “Save products prices” checkbox to the “Advanced Options” section (in “WooCommerce > Settings > Currency per Product > Advanced Options”). Could you please try enabling the checkbox – hopefully this should solve the issues you have. P.S. I think it’s a compatibility issue with some other plugin, e.g. “WooCommerce Bulk Discount”. The Pro version of the plugin only displays $inf or $0 for prices. Any ideas on how to fix? Could you please recheck if currency exchange rates are set in plugin settings? Also please try to set different exchange rates server, e.g. : “Free Currency Converter API (free.currencyconverterapi.com)”. In case anyone else has similar issues – as we figured out in private conversation – changing exchange rate server to another value (e.g. ECB) solved the issue. I am using the free version of your plugin at the moment and all seems to be working fine. I have set up one additional currency (AUD$) but it would be nice to have the option to display the “AUD” in front of the $ sign. I am guessing there are several countries that use dollars and I would prefer it if the price displayed was clearer. We have got a problem. Prices quoted with exchange rate are multiplied by 2 times exchange rate. Could you please try going to plugin’s “Advanced” settings section (in “WooCommerce > Settings > Currency per Product > Advanced”) and enabling “Save products prices” checkbox option there. Generally it looks like a compatibility issue with some other plugin. Enabling this checkbox will ensure that prices are converted only once, so hopefully it will fix it. I’m buying your pro version. Auto update enable. But i have got a problem. currency used on my site Turkish lira ( TRY ). When i added a product with USD for example 1 dolar, firstly it will change to 6.3 TRY. After other day it will be 39,69 TRY. Exchange rate able 2 times. What is problem? Hi, I have recently bought the product, but the plugin cannot use “TCMB Update Server”, It cannot update exchange rates. I integrated my products according to TCMB rates, If it is not working, the plugin has no importance for us. Can you please fix this issue? Your help will be appreciated. I’ve just re-checked on my test server, but unfortunately couldn’t reproduce the issue – it updated rates normally with TCMB server for the USD/TRY currency pair. 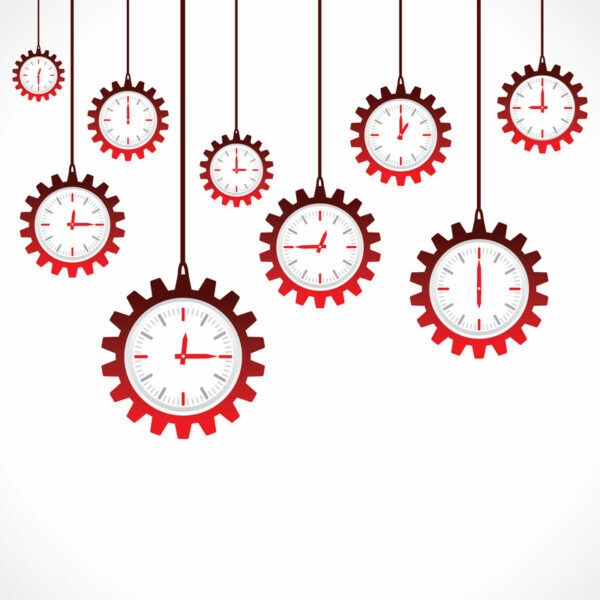 Which currency pair do you have that are not updating? Also – is it working if you set server to “Free Currency Converter API” (just to be sure if it’s a specific TCMB issue or more general issue)? Also if you wish you can create/share an admin account to your server (WP and preferably FTP), so I could login and check what’s going on (my email is [email protected]). Thanks for the reply, The plugin only works with “Free Currency Converter API”, when we choose TCMB, it doesn’t show exchange rates, yes, you can check the problem, I will send an admin account’s information from “[email protected]”. I installed the currency per product free version. But, I cannot add a second currency. My site is in EUR and I want to ad GBP. I can add GBP in the “currencies” tab, but I cannot save it. When I push the “save changes” button, nothing happens. I tried to replicate the above-mentioned issue on our staging site but I am unable to replicate it as I am able to save the other currency in the ‘Currencies’ tab. Can you please once try by deactivating all the plugins except WooCommerce and this plugin and check whether you are able to save the second setting? If yes, then try by activating plugins one by one and check the conflicting plugin and let us know. If the issue persists then please provide us the admin access at support at tychesoftwares dot freshdesk dot com. We shall check the issue on your site. Hello İ have same problem rates are not coming. I have tried to replicate the issue on our end but the added rates are working fine on the shop page when checked. Which currency pair do you have that are not updating? Can you please let us know that the rates are not working for any server set in the ‘Exchange Rates’ link. Also if you wish you can share an admin credentials of your site (WP and preferably FTP) at support at tychesoftwares dot freshdesk dot com, so we could login and check the mentioned issue. Thank you for purchasing our plugin for your site. In order to show only the single price in the base store set currency, you will need to select ‘Convert to shop default currency (including cart and checkout)’ option for ‘Shop behaviour’ setting and disable the ‘Add original price in shop’ setting. 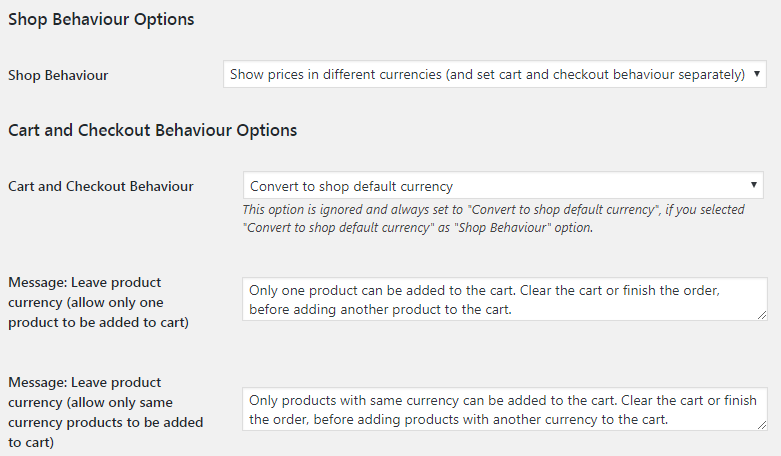 The mentioned settings are present under the Currency per Product->Behaviour link. I am having problems with the Currency Per Product plugin, the prices are changing at every page load. For example, the 2 currencies on my site is RM (Malaysian Ringgit) and SGD (Singapore Dollar), whereby roughly SGD 1 = RM 3. When I add a product for SGD 10, upon checkout the price in cart should be RM 30. But the price keeps changing from RM 30 to RM 60 to RM 90 upon moving from product page to cart to checkout. When we enable this plugin and have sale prices on our site, the pricing error occurs. When disabled it works normally. I do not know what changes needs to be done on which plugin, but if possible can you check to see from your side what is causing the problem? We have created a ticket for you on our ticketing system a week ago. Can you please check and revert us on that ticket? Does this plugin work with https://woocommerce.com/products/multi-currency/? I have created a ticket for you on our ticketing system. Can you please check and revert to us on the ticket? * Fix - Behaviour - Add original price in shop - Variable products fixed. * Feature - General - "Custom currency symbol" options added. * Fix - Variations currency in backend fixed (in case if "Convert to shop default currency (including cart and checkout)" is selected). * Fix - Exchange Rates - "ECB" and "TCMB" fixed on servers with allow_url_fopen option disabled. * Dev - Minor code refactoring. * Feature - Behaviour - Shop Behaviour Options - "Add original price in shop" options added. * Feature - Advanced - "Sorting by converted price" option added ("Sort by price" sorting). * Feature - Advanced - "Filtering by converted price" option added ("Filter Products by Price" widget). * Dev - Exchange Rates - "Yahoo" server removed (as it's discontinued). * Dev - Exchange Rates - Step decreased (to 12 decimals) in admin settings. * Dev - Raw input is now allowed in some plugin options. * Dev - Admin settings divided in separate sections, restyled and descriptions updated. * Dev - Major code refactoring; plugin folders structure changed; version_updated() function added. * Fix - Additional checks added to get_currency_exchange_rate() function to prevent division by zero and "non-numeric value encountered" notices. * Dev - Advanced Options - "Save products prices" option added. * Dev - Exchange rates updates - "Free Currency Converter API (free.currencyconverterapi.com)" server added. * Dev - Exchange rates updates - "European Central Bank (ECB)" server set as the default option. * Dev - Core - change_currency_code() function rewritten. * Dev - "WC tested up to" added to plugin header. * Dev - Plugin URI updated to wpfactory.com. * Dev - Admin settings descriptions updated. * Dev - WooCommerce v3.2.0 compatibility - Admin settings select type options fixed. 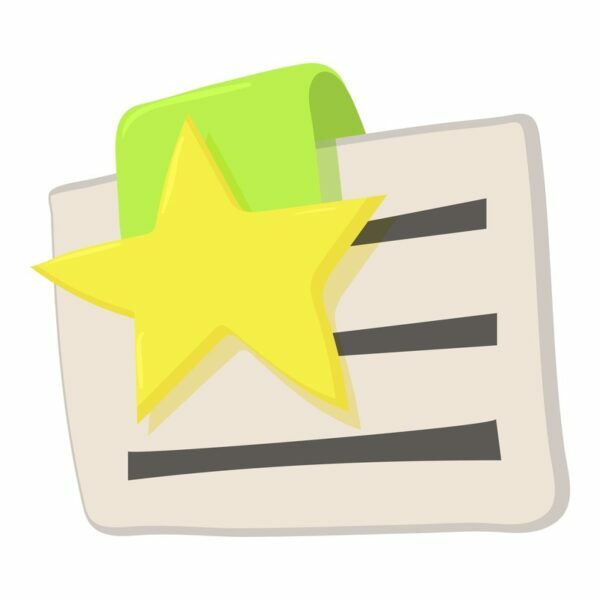 * Dev - Yahoo exchange rates server URL updated. * Dev - Admin settings - Minor restyling. * Dev - includes() - settings are saved as object property now. * Dev - POT file added. * Dev - "Shop Behaviour" option added. * Dev - Advanced Options - "Fix mini cart" option added. * Dev - Advanced Options - "Currency Reports" option added. Wish List for WooCommerce$19.99 Sale!